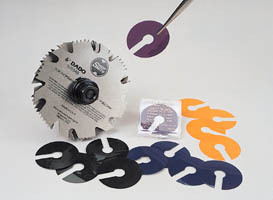 This set of 14 special shims will provide practically unlimited adjustments (from .002-inch to .138-inch) to the width of your stack dado cuts. Made of a special oil and grease-resistant polymer that won't swell, wrinkle or buckle, each features a 3/8-inch wide slot from edge to (5/8-inch ) arbor hole, so you can slip the shims into position without removing the blades, chippers or arbor nut. Each different shim size is color-coded for quick recognition. Includes: • Four Orange Shims (.002-inch thick) • Two Purple Shims (.005-inch thick) • Four Navy Shims (.010-inch thick) and • Four Black Shims (.020-inch thick) in a • handy, see-through plastic storage box.